Sports cars are brilliant. Convertible sports cars are also brilliant. The Jaguar F-Type and Porsche Boxster are the two best convertible sports cars on the market. Which one is better? I've driven both extensively. It's the Speedmonkey Convertible Sports Car Face-Off! Which one is best for posing in? This comes down to two factors - rarity and looks. Simply put the F-Type is the best looking mass market car on the road today. It was designed from a clean sheet of paper whereas the Boxster is in the third stage of its evolution. The Boxster is handsome and one of the best looking Porsches ever made, but the F-Type is just glorious. The Boxster is also fairly ubiquitous, and most people won't know the difference between a 981, 986 or 987 but the F-Type is still a rarity on the road. Which one has the best interior? The Boxster's interior is more purposeful than luxurious. It feels well-engineered and put together and everything is where it should be, but it doesn't exhibit much in the way of flair. The F-Type's interior is other-wordly in comparison. Where the Porsche has plastic the Jaguar has leather. Where the Porsche has lovely, tactile materials the Jaguar's are just that bit better. Both are superb but the F-Type is slightly more so. Which one handles the best? The F-Type is one of my favourite cars to drive. Its front engined, stiff aluminium chassis gives it almost as much feel and feedback as a Lotus. The steering is oily smooth and way you can hold it around a corner is thrilling. The Boxster S has the engine out back, just fore of the rear axle. The car's balance is ethereal. The ride over normal roads is more composed than the Jaguar's and around corners it has more grip and even more feel and feedback. Despite the fact the Boxster has electrically assisted steering and the F-Type's is hydraulic the Porsche has better feel, just. This area is the Boxster's piece de resistance and it is unbeatable. Which one sounds the best? The F-Type in V6 supercharged form crackles and pops. The engine howls and it growls. The exhaust is engineered to make the best of the car's sound. The Boxster is naturally aspirated and, despite what you might think about Porsche, they have engineered a lusty engine sound and exhaust note, and the active exhaust can sound disgustingly dirty (in a good way) when coming off throttle. They both sound good, the Porsche's gunshot gear changes sound fantastic but the exhaust note booms more than the Jaguar, however the Jaguar wins this one by virtue of its almost constant good noise whereas the Porsche sounds really great only when pressing on. Which one is the purest sports car convertible? We've established that the Boxster handles marginally better. It never (in normal conditions) loses grip by virtue of the engine's weight over the rear whereas the Jaguar will drift whenever it feels like it. Both cars have a fabric roof that folds up or down at up to 30mph and both cockpits are composed with the roof down. The Jaguar's engine is perhaps more flexible but the Porsche's PDK and manual gearbox are both better than the F-Type's 8-speed automatic. The Jag gearbox is great but the Porsche options are better. The Jaguar might be better for posing but the Porsche is very slightly a better sports car, that happens to be a convertible. Which one is most practical? Both have not much in the way of interior space. The Boxster gets two door pockets per door, a glove box and a tiny space under the armrest. The F-Type has one pocket in each door, a bigger space under the armrest and a glove box. Both have cup holders (the Porsche's fold out rather elegantly and the Jaguar's are aft of the gear lever). The Jaguar has one tiny boot but the Porsche has a large boot at the front and one just as big as the Jaguar's at the rear. The Porsche wins this category by dint of it's extra boot. Which one is the best value? The F-Type costs £67,520, returns 31mpg and emits 213g/km of CO2. The Boxster costs £48,034, returns 35.3mpg and emits 188g/km of CO2. On paper the Boxster wins by a mile, but the Jaguar is a posher car. Its interior and exclusivity count for a lot in this market, plus it's almost completely hand built whereas the Porsche is made on a production line (and some in VW factories). Both manufacturers make a healthy profit on each car sold but I suspect Jaguar makes more. The Porsche can't fail to win this but only just when everything is considered. As you can see the Porsche is cheaper, weighs less and has less power. The Jaguar has much more grunt and is marginally faster - but only by a sliver. The Boxster is perhaps better engineered in that it makes more efficient use of the engine in a lighter chassis. Given the cars each adopt a slightly different philosophy this one is our first draw. 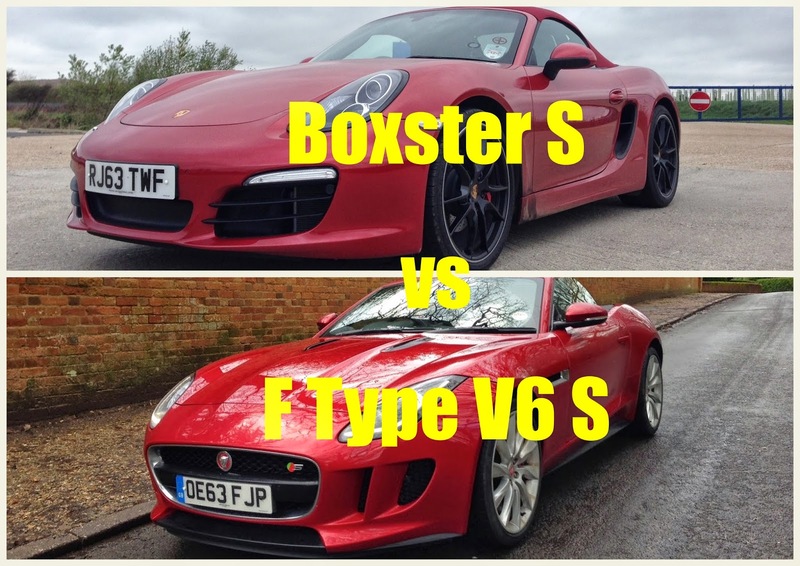 The Jaguar F-Type V6 S won three rounds whereas the Porsche Boxster S won four. It's a marginal victory to the Porsche. If I had to put my hand in my own pocket and buy one I'd struggle to choose. I've run a Boxster and F-Type for a week each. The F-Type gives more smiles per mile but the Boxster has a purity that the F-Type can't quite match. Ultimately the price would come into it so the Boxster would probably win, but I'd be forever looking lustfully at F-Types from the comfort of my Porsche.